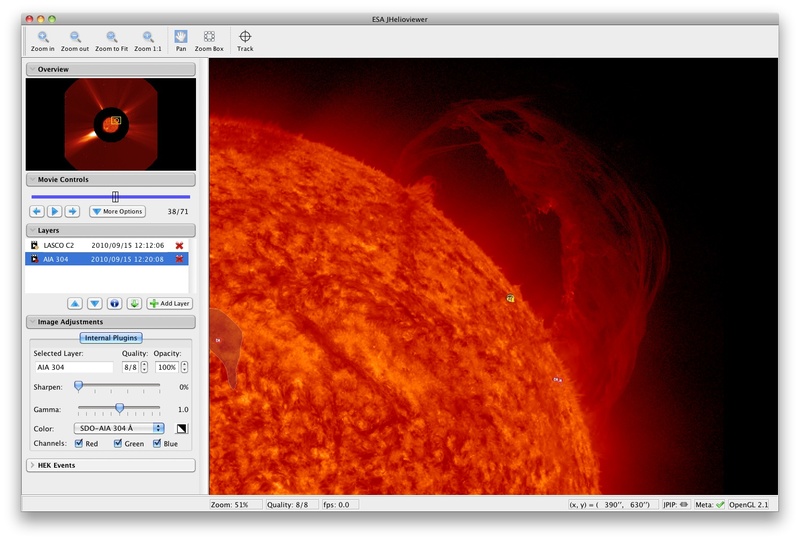 JHelioviewer is new visualization software that enables everyone, anywhere to explore the Sun. 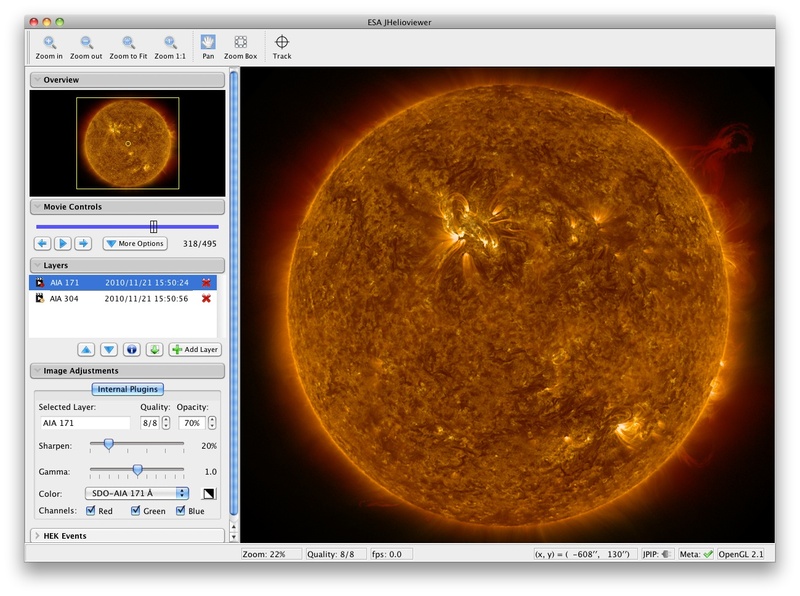 Developed as part of the ESA/NASA Helioviewer Project, it provides a desktop program that enables users to call up images of the Sun from the past 15 years. More than a million images from SOHO can already be accessed, and new images from NASAâ€™s Solar Dynamics Observatory are being added every day. 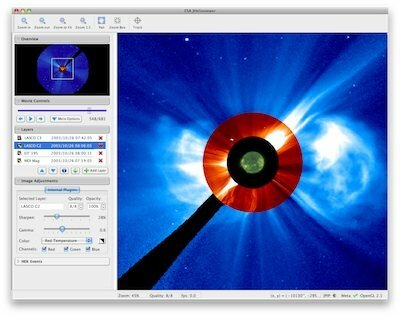 Using this new software, users can create their own movies of the Sun, colour the images as they wish, and image-process the movies in real time. They can export their finished movies in various formats, and track features on the Sun by compensating for the solar rotation. However, the true power of the tool lies in its ability to allow cross-referencing of different aspects of the large data sets; many events observed on the Sun are interconnected and occur over vastly different temporal and spatial scales. 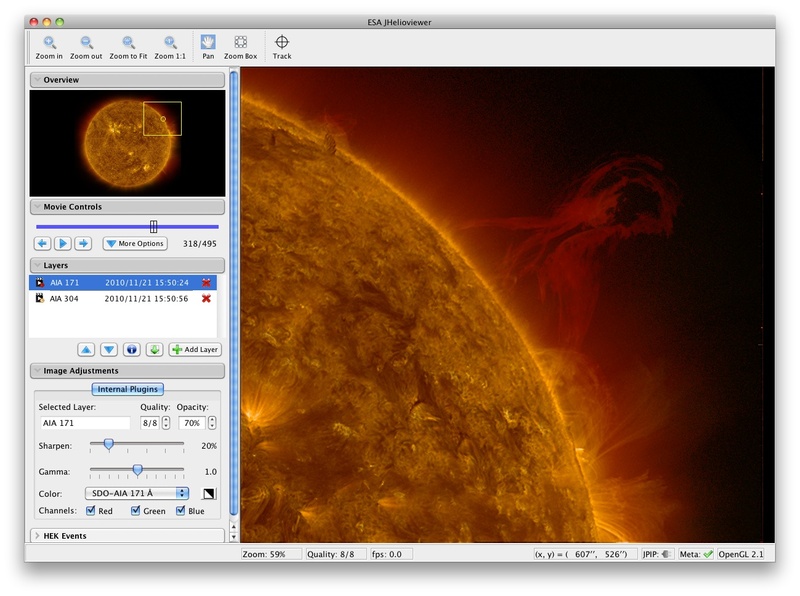 For the first time, JHelioviewer allows users to overlay series of images from the Sun, from different instruments, and compile an animated sequence, which they can then manipulate as they watch, in order to follow a solar event from start to finish. Existing tools provided the option to either see the large-scale corona, or small patches on the solar surface but there was no option to overlay the two and zoom in and out as you watch the Sun's activity evolve. JHelioviewer tackles this hierarchy of scales by coupling all solar scales: you have small scale phenomena tying into large scale events. JHelioviewer is written in the Java programming language, hence the â€˜Jâ€™ at the beginning of its name. It is open-source software, meaning that all its components are freely available so people can help to improve the program. They can even reuse the code for other purposes; it is already being used for Mars data and in medical research. This is because JHelioviewer does not need to download entire data sets, which can often be huge; it can just choose enough data to stream smoothly over the Internet. It also allows data to be annotated, say solar flares of a particular magnitude to be marked, or diseased tissues in medical images to be highlighted. The JHelioviewer software is available to download for several operating systems. It is complemented by the web-based image browser found at Helioviewer.org. Credits: JHelioviewer has been developed as part of the ESA/NASA Helioviewer Project (Principal Investigators: Daniel MÃ¼ller (ESA), Jack Ireland (ADNET Systems, Inc./NASA Goddard Space Flight Center)) by an interdisciplinary team of solar physicists and computer scientists. It is based on the JPEG 2000 image compression standard and written in Java and OpenGL. The server hosting the software and related JPEG 2000 files is located at the Solar Data Analysis Center (SDAC) at NASA's Goddard Space Flight Center.